EZCAPS USER FORUM - Go to www.e-z-caps.com to purchase on our web site • View topic - Can you accurately measure alcohol content? I'm brand new to this - my first batches of cider and (sort of) wine have been bubbling away for a week now! I just wanted to ask if anyone knows of an accurate way to measure alcohol content? I plan on doing a few batches to experiment and I'm keeping all my recipe details, but I'd like to be able to be able to keep an accurate record of alcohol content as well as notes on taste, flavour etc. Re: Can you accurately measure alcohol content? Yes. 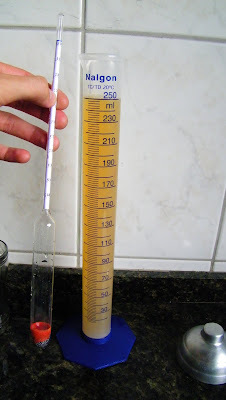 You need to buy a hydrometer. Take a measurement before and after brewing. The difference between the two is the alcohol content. I use this alcohol calculator http://www.brewersfriend.com/abv-calculator/. It is very easy to use, maybe not the most accurate, but more than enough for what I need. An hygrometer is cheap and easy to use... so go for it! Cool - thanks for the advice guys. I found this one with a quick Amazon search. Is it adequate? You can find it in most homebrew supplies shops. Plastic one is OK and no need to have any scale. I have to ask how you measure with a hydrometer when these E-Z-Caps make a carbonated beverage. I've made wine before so I know how to use the hydrometer.. and when I started my first 3 E-Z-cap bottles i measured with the hydrometer. All were around 1.09.. So I cannot seem to get an accurate density reading. Do I need to let the liquid sit for awhile or something? Just not sure what I am doing wrong..
try to move the hydrometer to remove the bubbles from the glass, it works for me. I will have to try to move the hydrometer tonight and see what I can come up with. I wasn't seeming to have any luck before though. I tried pushing it down and it just popped back up to almost completely out.